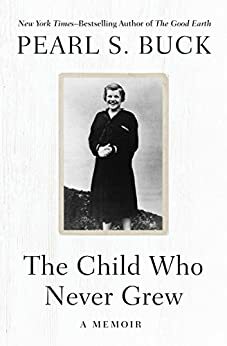 This short book is a tragic, first hand account of being the mother of a child who although born normal, became retarded as she grew physically but not mentally during her childhood. This child, we now know, had an inherited genetic disorder called PKU, phenyketonuria, that poisons the brain and causes mental retardation if not treated early during infancy with a special low-protein diet. I myself have two daughters with PKU, both treated successfully in infancy and childhood - because the times have changed, their outcomes were so much better. The author, Pearl Buck is a great writer, and was the first woman to win a Pulitzer Prize in literature, but I didn't know that when I first discovered her writing. I read her novel The Good Earth when I was a little girl, after it was sent to my mother from my uncle - who then lived in China. I loved that book, though my uncle was dismayed that my mother had let me read it. Of course then I had no way of knowing Pearl Buck and I would share the fate of having a child with PKU. Read her story to get a glimpse into her private world of pain, deciding how to best care for her disabled daughter. But also read it to understand how vital universal newborn screening is today, that picks up PKU at birth, enabling normal childhood development of people born with PKU. Pearl S. Buck writes lovingly of her special needs daughter who was eventually placed in Vineland, N.J. State School near my hometown. This exceptional author has been an inspiration to so many and her books are beautifully written and thought provoking. I enjoyed this book and learning more about her personal life. Insightful and earnest in presentation of the issue of mentally retarded or delayed children. Pearl Buck exposes her heart-rending decision of placing her daughter in an institution so that the child would have a safe environment. I appreciate her honesty. Pearl Buck took a courageous stance to tell the story of her mentally disabled child at a time it was more socially acceptable to hide mental retardation. This book did wonders to bring mental disabilities out of the proverbial closet into the light. I grew up in Vineland, New Jersey. I worked at the Training School at Vineland. I’ve seen Carol but never worked with her. I was only in my early 20s then. If I’d have known more about the things the Author describes, I could have had a better impact I feel. That is my regret. This was a wonderful book and I feel a big help to parents with Special needs children. Good advice to them.